The craft distilling industry is experiencing a major boom right now, just as the craft breweries did in the 1990s. Craft distillers operating in the US have increased by 20.8% since August of last year. And just a few months ago, the craft distilling industry was handed a pretty big win that’s bolstering that growth; the Tax Cuts and Jobs Act was passed, decreasing the federal excise tax on craft beverages from $13.50 to $2.70 (an 80% reduction) for the first 100,000 gallons of spirits produced. This lower federal excise tax means craft beverage companies now have an influx in cash and are using it to invest back into their businesses, doing things like buying new equipment, adding new staff members, and getting into new markets! To understand the flaw in our state’s current tax structure, we need to first examine the origination of the excise tax. Excise taxes on alcohol products are more commonly known as sin tax. Sin taxes have been around since the 1920s (originally called Pigovian taxes). The original intent for these Pigovian (sin) taxes was to discourage the sale and use of “harmful” products by making them more expensive. Since their introduction, sin taxes have been criticized by both sides of the political aisle; conservatives criticize sin tax for their overreach and liberals argue that sin tax disproportionately affects the poor. At their core, excise taxes are an attempt to modify the behavior of society. But what behavior do we seek to modify? Generally speaking, intoxication is what we are trying to deter, but more specifically, the ease at which it occurs. The most common argument for a higher excise tax on spirits is that it’s much more “harmful” to an individual than beer (i.e. it’s easier to become intoxicated with four shots of a spirit than four beers). While this statement is true, it fails to take into consideration the primary mechanism that is causing the intoxication —alcohol by volume (ABV). ABV is the standard measurement for how much alcohol is contained in a beverage and is something that’s heavily monitored by the government. 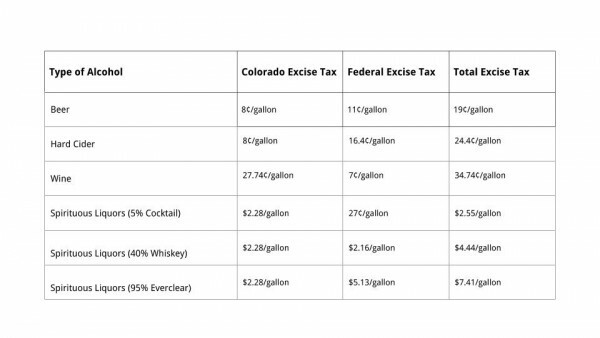 Below is a breakdown of state excise taxes in Colorado and federal excise taxes for alcoholic beverages. As you can see, spirits are being taxed at 8 to 29 times the rate as beer, cider and wine at the state level in Colorado. However, a 5% ABV beer has the exact same effects on a person as a 5% ABV spirit. Instead of focusing on the type of alcoholic beverage, all alcoholic beverages should be taxed by their ABV, not by volume. By accounting for ABV in excise taxes, we are taxing the externality that causes the behavior we want to modify, which follows the true logic behind excise taxes and remains consistent with accomplishing the intended goal of discouraging excessive consumption. Craft beer averages 5.9% ABV, so to keep the taxes at their current level, the Colorado excise tax on all alcohol should be 68¢/ proof gallon. A proof gallon is one gallon of 50% alcohol. Alcohol at other percentages have their volumes converted to what they would be at 50%, so one gallon of 5.9% beer would be equivalent to 0.118 proof gallons. Dropping the tax rate would be a boon to wineries (average of 16¢/gallon) and distilleries (40% ABV would be 54¢/gallon), while not hurting our craft breweries. Once state excise taxes evolve and mature to account for ABV and distilleries and wineries are on equal footing with breweries, we can increase the number of craft distilleries, allow for greater expansion of existing distilleries, and enable the craft distillery industry to become a prominent contributor to our growing economy and unique boozy culture. Devin is a distillery engineer, lead distillery consultant at Distillery Craft Consulting, host of Distilling Craft Podcast, and the brains behind this whole operation. A Licensed Professional Engineer with an MBA from the University of Colorado, Devin found his calling as a distillery engineer early in his life when he began making Apple Brandy as a hobby. Now, Devin is a sought-after distillery consultant who helps others attain their dreams of owning a successful craft distillery.